The mining industry is as vital to today's global economy as ever before, yet it is at a crossroad. It is an industry that is currently combating multiple adverse global trends such as falling commodity prices, a slowing global economy and skilled labor shortages. IIoT is making its way into mining sites, however mining is an industry with great traditions where change is at times very gradual. Mining is a very old business and it can be reluctant to embrace new technology. It is difficult to leave behind a suite of tried-and-true processes when the focus is on production and profits. More often than not, the adoption of new technology, just like the adoption of any new process in the mining industry, has to improve the bottom line or meet a mandated requirement or regulation. The dramatic changes in technology don't seem to be quickly accepted because of the historical union management relationships. Older workers who are working underground don't want to change the pattern. In many cases, resistance is not to the equipment itself, because they think it's safer, but to the whole change in behavior. There is a network of tunnels underground, much like roads. Preparing for the IIoT, providing networking, and enabling real-time data underground will require investment. Innovators need to be particularly mindful of working with infrastructure and technology that can withstand extreme conditions. Particularly conditions in Northern countries where extraction will occur in very remote areas with extremely cold temperatures. Traditionally the mining industry doesn't regard itself as being an operator of a system but rather being the operator of equipment. This commercial evolution in the equipment supply chain becomes necessary when technology really matters. Mining is not doing a lot of research, so it is not really familiar with trying out new ideas. Oil and gas does a lot more. Almost all the oil and gas companies have huge R&D budgets. The mining sector spends 80% less on technology innovation compared to the oil and gas sectors. Mining tends to be very shareholder-driven and oriented to short-term thinking because it's such a cyclical industry, driven by commodity prices. Every time the prices drop, companies cut back, usually starting with the technology and innovation department. With the IIoT being fairly nascent, the issue arises of integrating both old and new systems and machines. The lack of standards and integration is a primary challenge. Instead of having one shared GPS antenna, one truck will have nine antennae on it, because each control system needs to puts its own equipment in place. The key, of course, is an IIoT system that can plug-and-play. For technology adoption in mining to succeed, it generally has to improve the bottom line or meet a mandated requirement. Mining operations have already been tweaked with the pre-IoT technology, so any new process must show a significant improvement above the status quo. When a truck can produce $15,000 in revenue per hour, the loss of that truck for any reason quickly becomes very costly. A key imperative is to integrate IIoT solutions with as little interruption for customers as possible. It's naive to think that PLC manufacturers and mining companies are going to tear out legacy PLCs. Mining systems are difficult to upgrade and pose a daunting challenge because they were never intended to be upgraded. Zotera's innovative solutions have been developed using IIoT "best practices" and our seamless integration of key technologies provide the information that enables mission-critical business decisions. Zotera offers an end-to-end Asset Management solution that provides the foundation for seamlessly and securely connecting devices, delivering trusted data to the cloud or data center, and delivering value through real-time analytics. The Zotera IIoT Platform (collectively Zotera Insight, Zotera Radius & Zotera Stratos) enables a deeper and completely scalable set of solutions from the integrated sensors deployed across the value chain and from exploration, production to the transportation of ore, supply chain management, and ultimately to business optimization, Zotera provides visibility and workplace safety, with better control and maintenance of assets. Zotera Radius allows us to bring intelligence to the edge of the network delivering trusted data and the capability to run analytics near the sensors. Data captured from sensors at the edge are analyzed by Zotera Stratos to inform and control devices and machines. This data is delivered to systems at the Command Center to enable real-time insights, streamline operations, and to enable the efficient utilization of resources. Zotera's marriage of smart devices, advanced connectivity, and management platforms offers mining companies a clear foundation for innovation that will help to increase efficiency and the development of new business practices. 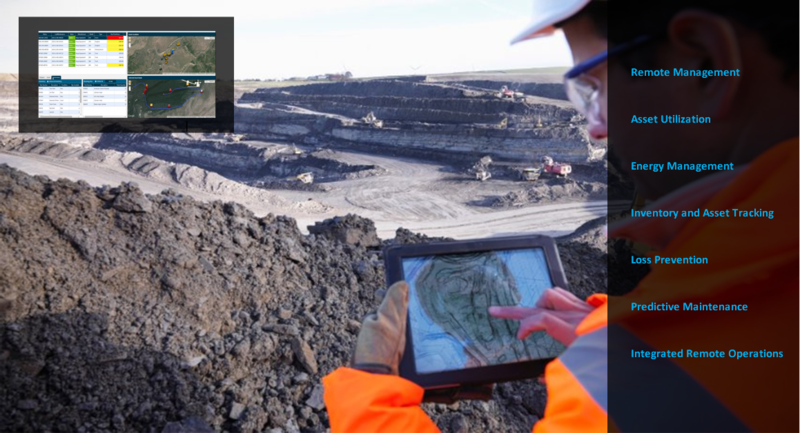 Insight-enabled devices and systems can facilitate efficient mining operations, with minimum human intervention, providing higher value than traditional technology and automation.